Black Steampunk Submarine Gas Mask Masquerade Mask - Sculpted Flexible Plastic, Silk Tie Ribbons, Original Design - Dimensions 10 1/4”x9”x8 1/2” | BUDK.com - Knives & Swords At The Lowest Prices! A cool blast from the future-past! 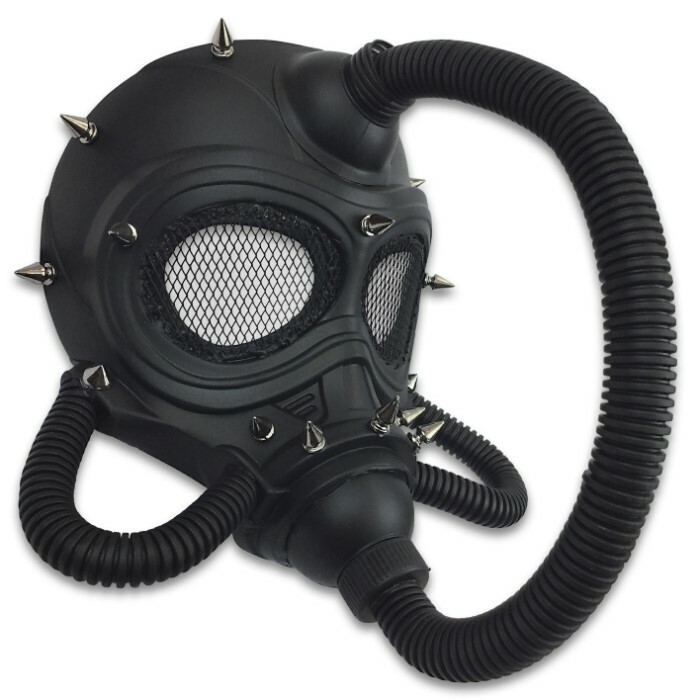 Complete any post-apocalyptic costume with the Black Steampunk Submarine Gas Mask that looks just like iron though it’s made of lightweight flexible plastic. It’s great for raves, conventions, Halloween and any kind of party you want to dress up for. Also, wearing it eliminates the need for messy makeup or face-paint. Ribbon ties at the back help ensure the most comfortable fit, and when you’re not wearing it, it’s a fun prop you can hang on the wall. If you’re looking for something a little different, this is the prop that can make all the difference in your costume.